Jim Hammond put on nearly 2900 miles roundtrip from his home in Southern California to attend the Heartland Nationals, where he ran the table in the Top Alcohol class. 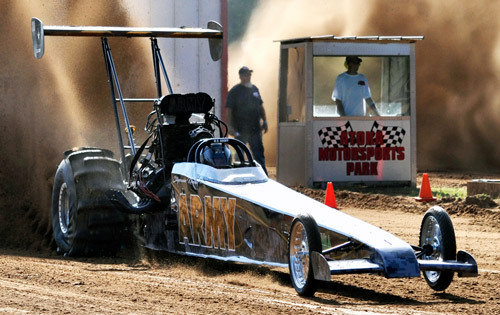 Jim qualified #1, ran Low ET with a 2.62 and won the event defeating Randy Kimbley in the final round. 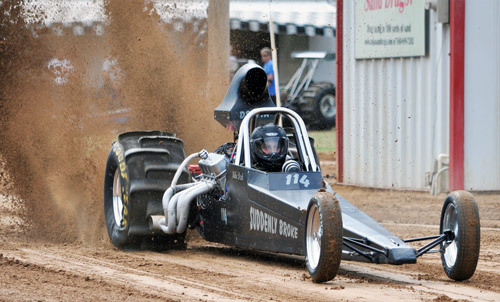 Missouri's Terry Glasscock emerged victorious in the ultra competitive 19 entry Top Eliminator category at the Heartland Nationals. Terry's turbocharged Pinto-powered Dragster qualified #2 with a 2.964, then made his way through eliminations to defeat Vickie Hall in the final round with a 2.99. Jimmy Evans put the JE Motorsports Dragster in the Pro 1 Cars Winners Circle topping a tough 25 entry field. Tommy Springer did a nice job taking the Friday night Quick 16 Quads title. New Mexico's Vickie Hall continued her dream season with a Runner-Up finish at Atoka. Vickie qualified #3 with a 2.97 and sliced through the strong Top Eliminator field before falling to Terry Glasscock in a great final round. Texas racer Rodney Fisher had a great showing at the Heartland Nationals as he scored the prestigous Quick 16 Cars class victory as well as the win in Saturday's 3.8 Index class title. 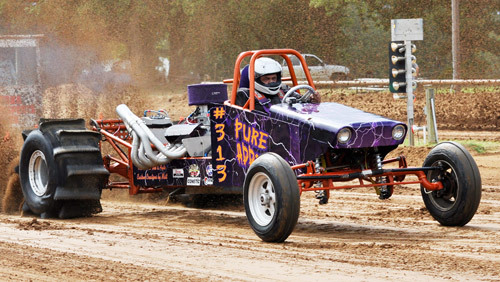 Last year's Mid-America series champ Nick Allen had a nice showing at Atoka taking the Saturday 4.0 Index class victory. Mike Dzek had a big weekend at the Heartland Nationals as he won the Saturday 3.5 Index class to go along with his Quick 16 Cars semi-final finish. Leah Steelmon continues to improve her driving skill and it showed at the Heartland Nationals as she scored the Pro 2 Cars class victory. 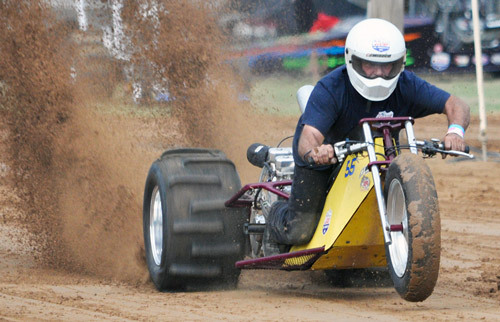 The JE Motorsports boys had a big weekend at the Heartland Nationals. 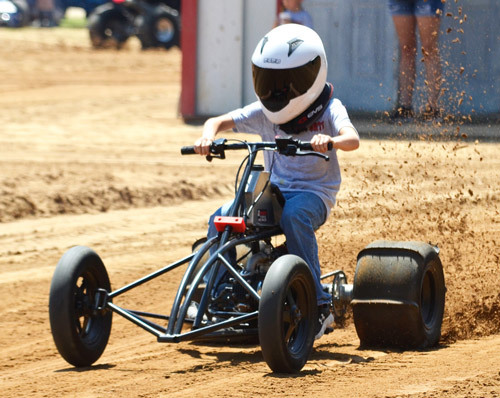 Jackson Evans took the Pro 2 Quads class win while Jayden Evans defeated Jace Evans (Pictured) in an all-JE Pro 4 final round. 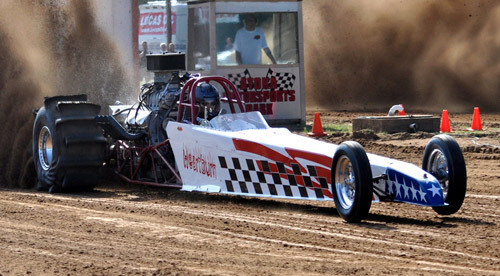 John Pate had a stellar weekend at the Heartland Nationals as he qualified #1 with a 2.956 and made it all the way to the semi-finals of the tough TE class before bowing out to Vickie Hall. A huge shout out to John for not only his efforts on track but all he does to make the events at Atoka Motorsports Park happen. Oklahoma's Randy Kimbley was extremely busy at the Heartland Nationals behind the wheel of the ARMY Top Alcohol Dragster and his Blue Dog TE ride as well as his normal Pro 1 Car & Pro 1 Quad. 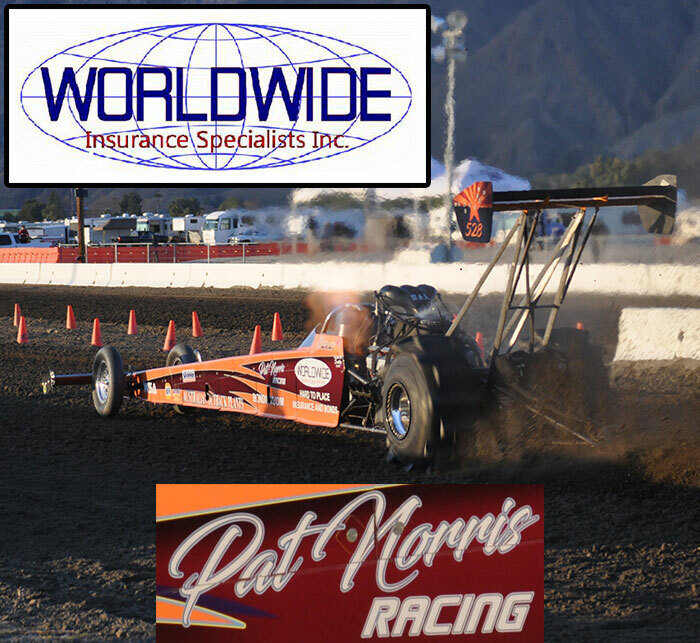 Randy ended up with a Runner-Up finish in Top Alcohol as well as a strong semi-final finish in the Pro 1 class. Ohio's Kyle Farwick brought the Dreher Race Cars #SmallBlockMafia-powered Altered to Oklahoma for the first time to compete in the $4K to win TE class. Kyle qualified #9 with a 3.06 in the stout field and advanced to Round Two before falling to eventual winner Terry Glasscock in an extremely close race. The always tough Amanda Mathews made it all the way to the Pro 1 Cars final on Sunday before falling to Jimmy Evans. 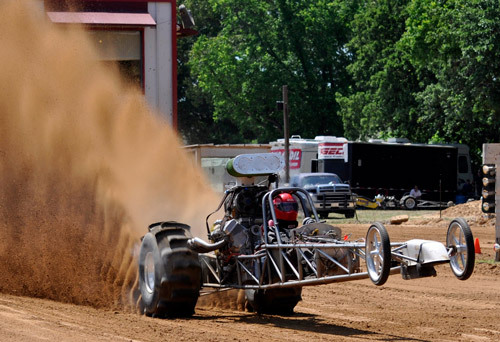 Damon Hall with another wheels up charge in the Krank-E Fiat at Atoka. Damon qualified #10 in the tough Top Eliminator class and dropped a good race to top qualifier John Pate in Round 2. 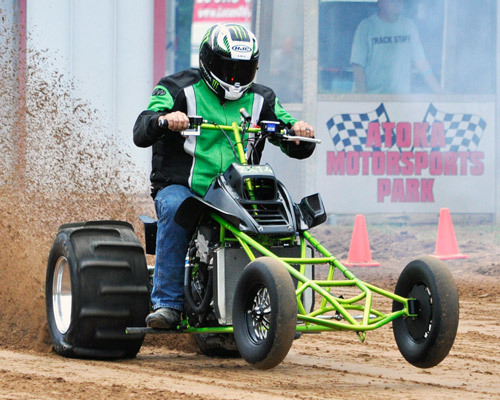 Arizona's Mike Brock had one of the most impressive performances in the ATV classes at the 20th Annual Heartland Nationals. 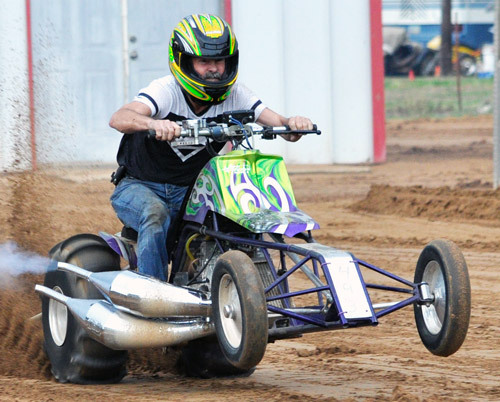 Mike was Runner-Up in three classes throughout the weekend: Quick 16 Quads (Friday), Heads-Up Index (Saturday) to his teammate Chris Carlson and Pro 1 Quads (Sunday). 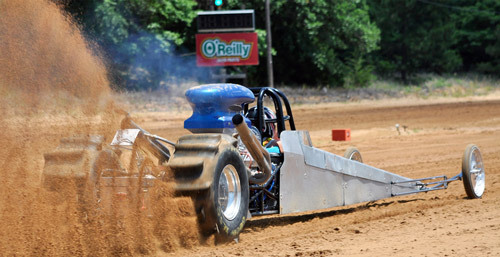 John Acker had an impressive debut in the Top Eliminator class at the Heartland Nationals. The Texas racer qualified #5 with a 2.99 and made it to Round 2 before falling to the always tough Russ Bailey. 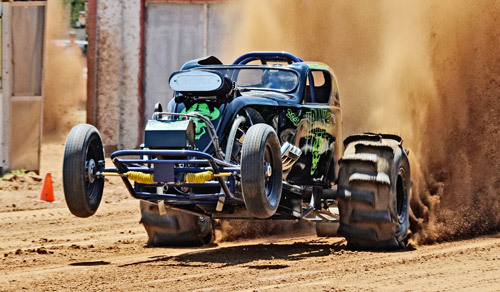 Check out this nice wheelie from TE #4 Qualifier Marc Luce. The Atoka local Luce ran a solid 2.97 to qualify #4 before bowing out to Jeremy Click in Round 2. 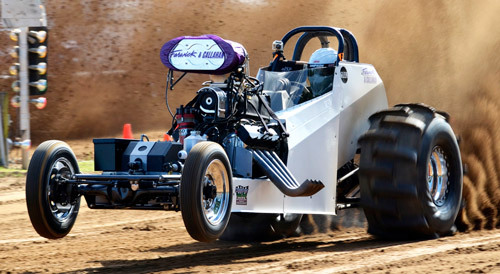 Thunder Valley Sand Drags track operator Jeff Sieg with a great wheels-up charge in his TE Dragster. Jeff was the #8 qualifier with a 3.04 ET.